Digital partnerships is one of the main themes this year at ABB’s booth in Hall 11 at the Hannover Messe, the world’s largest industrial trade show. Innovation is at the forefront of everything ABB does. That's why ABB is partnering with leading global companies, to accelerate digital transformation and enable customers to unlock the unprecedented improvements in performance and productivity that digitalization delivers. ABB has strategic digital partnerships with Microsoft, IBM, Hewlett Packard Enterprise (HPE) and Dassault Systèmes. Each strategic global partnership brings ABB together with a world-class organization, to create an unmatchable combination of technological expertise and domain knowledge focused on developing enhanced digital solutions. ABB’s partnership with Microsoft utilizes Microsoft Azure intelligent cloud services to support ABB’s Industrial Internet of Things (IIoT) platform and the ABB Ability™ digital offering. ABB and HPE deliver joint industry solutions that merge operational technology (OT) and information technology (IT), while IBM is the preferred partner for artificial intelligence (AI) solutions and Dassault Systèmes brings the digital twin to the factory of the future. In Hanover ABB showcases solutions to some of the world’s biggest challenges, which are addressed by the Energy and Fourth Industrial Revolutions and are changing the way we power our societies, produce our goods and services, and work, live and move. The Fourth Industrial Revolution, for instance, is shaping the factory of the future by processing ever-growing volumes of data generated from smart automation and producing analytics that drive performance. As a pioneering technology leader in digital industries, ABB is mastering these challenges with its suite of ABB Ability™ digital solutions. ABB and its partners will show their joint solutions across the fairground. Use this interactive map to find out where. ABB and Dassault Systèmes will spotlight digital twin and factory modeling solutions, including a digital twin model of a complete factory and an ABB RobotStudio demonstration of a digital twin application for a spot-welding robot. ABB’s factory of the future, which is on display in the ABB booth delivers a custom-made watch within three minutes. It demonstrates the vast possibilities of modern production. The factory of the future enables companies of any size to be as flexible as possible, while increasing productivity, enhance operational efficiency and improve safety and security. ABB’s factory of the future at the Hannover Messe features industry-leading digital twin technology, which makes it possible to amend and optimize manufacturing without interrupting the production process. The solution is the first result of a strategic partnership between ABB and Dassault Systèmes, which was announced last month. It is also a testimony to ABB’s partnership strategy to deliver customer value at the cutting edge of industrial digitalization. Going forward, the recently announced global partnership will offer customers in digital industries a broad portfolio of software solutions ranging from product life cycle management to asset health solutions. In its initial stages, the partnership will focus on three key areas: factory automation and robotics, smart buildings and process industries. Digital twin experiences for end-to-end optimization of processes and systems, combined with the flexibility of robotics automation, will give factories the agility to adapt to increasingly dynamic markets. For smart buildings, digital twin systems will enable seamless workflows during design, engineering and operation of buildings, as well as connected sustainable transportation solutions. In a process industry like mining, digital models of underground operations will enable operators to monitor and optimize production in real-time, while running virtual simulations of future scenarios. ABB and Microsoft will exhibit Microsoft Azure-powered solutions that facilitate digitalization of industries. 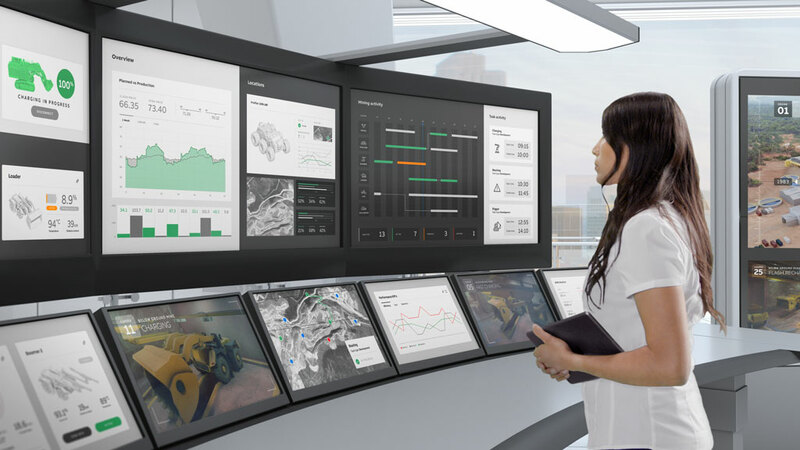 In intelligent manufacturing, Microsoft will display a dashboard that provides real-time condition monitoring of the factory of the future that is in operation in the ABB booth. Showcasing the future of living, a centralized, collaborative operations control room will monitor all aspect of smart-city infrastructure, including the status of utilities, buildings, transportation and communications services. ABB and HPE will showcase solutions across cities, energy and industry. The Secure Edge Data Center (SEDC), the all-in-one, industrial data center solution developed in collaboration among ABB, HPE and Rittal, enables customers to rapidly deploy cloud-based digital services. As a result, enterprise-grade IT capacity can be installed in close physical proximity to the point of data collection and machine control. A related display will demonstrate the combined power of the HPE Edgeline EL300 Converged Edge System and ABB Ability™ EdgeInsight. The HPE EL300 implements data center-level compute and management technology at the "edge" – the IoT locations, such as factories or oil rigs, where big data is generated. ABB Ability™ EdgeInsight collects and securely handles that data so it can be used for visualization, analysis and optimization of operations. ABB and IBM are emphasizing solutions which spotlight the predictive capabilities of AI. One demonstration will feature ABB Ability™ Solution for Renewables,which provides detailed forecast of wind turbine output using machine learning from IBM’s Watson, weather forecast models and data based on ABB’s grid insight.